Posted December 12, 2014 by Seán Kinane & filed under Civil Liberties, Human Rights, News and Public Affairs. 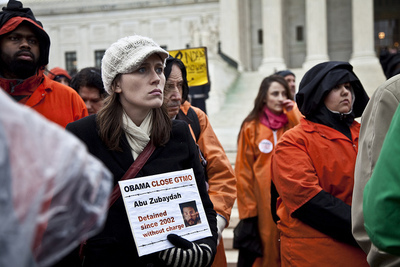 In the summary of the U.S. Senate’s report on CIA torture the abuse of one prisoner is mentioned dozens of times; Zayn Abu Zubaydah was the first person the CIA disappeared into its secret prison network and the first subjected to a number of so-called “enhanced interrogation techniques,” which are generally considered torture. For example, he was waterboarded at least 83 times. Abu Zubaydah’s brother, Hesham, lives on the east coast of Florida, in Brevard County. To find out what the family thinks about the torture report, Friday morning WMNF spoke by phone with Hesham’s wife, Jody Abu Zubaydah.